After doing herself near-fatal damage, Kit Learmonth has come home. But it’s a place she hardly recognises: the mermaids are hiding, the witch has packed up her cauldron and the pirates have sailed to more bountiful shores. In their place is Neverland and its inhabitants - damaged teens too sick to be in regular school, but not sick enough to be institutionalised, watched over by her psychiatrist uncle. And Kit is one of them. 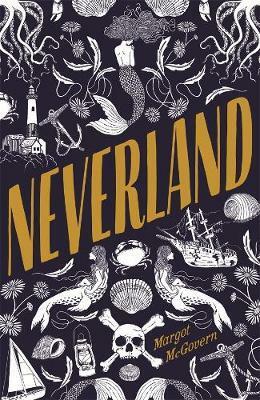 Neverland is the unofficial name for the island of Learmonth, a place of sanctuary for troubled teens dealing with mental health issues. This is the place where Katherine is sent following a self-harm episode. But for Katherine, Neverland is not just a place of sanctuary but her home ground. This is where she was raised, and where her father penned his famous, semi-autobiographical work titled The Kingdom of the Sea; a work that imagined a world inhabited by selkies, pirates and sea monsters. In this work, Katherine was cast as a character that was so perfect that the real Katherine felt herself a disappointment and an unfortunate ‘faux pas of existence’. But her greatest struggle relates to the buried trauma that threatens to pull her under. The island presents a powerful metaphorical element in this work. It is separated from the mainland by a treacherous passage of sea where a two-hundred metre wide hole (depth unknown) turns the water a darker shade and the ocean floor drops away. Katherine’s father had told her that a monster lived in the hole but the scariest imagining for Katherine was a ‘void of unchartered horrors’; that is, the buried psychological trauma relating to the death of her parents. Rebellion, too, is a powerful change agent in this story and Katherine teams up with close friends, who are also patients, against the healthcare workers that are trying to help them. These teens are well stocked with contraband such as drugs and condoms and, in Katherine’s case, razor blades for self-harm purposes. But their vulnerability is palpable and the reader is cast adrift between one broken teen and another as the teens struggle against their personal demons and fight for their well-being. This is a powerfully emotional and mythic work that draws parallels with the journey of Odysseus, cast adrift on the high seas, in pursuit of safe harbour.